Cruising on a luxury yacht is for many, a dream vacation. The open seas, warm air and 360 degree views are unbelievable. Make it a reality by booking the M/Y My Way luxury yacht from Mondomarine. 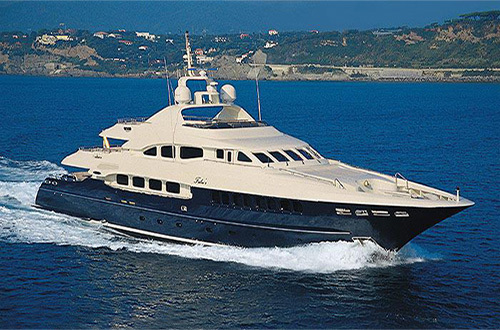 The motor yacht My May yacht was built in 2005 and underwent a refitting last year. It’s time for you to enjoy an unbelievable experience. Make plans to cruise in VIP style. This 40.05 meter (131 feet 5 inches) superyacht awaits your family and friends to come aboard! The My Way yacht was built by Mondomarine and provides its guests 5 sleeping cabins. By accommodating up to 10 guests, there’s plenty of room for privacy and comfort. You will amazed by the interior decor. It is luxury through and through. The 5 cabin configuration consist of 3 double beds and 2 twin beds. It actually feels like a floating hotel and offers endless, luxury amenities. As you cruise the western Mediterranean Sea, you’ll feel like a king. What better way than be part of an outstanding, luxury cruise experience. Don’t worry that you can’t connect with the world back home. This luxury yacht is equipped with WiFi. Tweet about your journey and send incredible photos via Instagram. When it’s time to relax and take in the beautiful surrounding, take a soak in the on-deck jacuzzi. Summers in the Mediterranean can be quite hot. Beat the heat and head indoors to cool down with the yacht’s own air conditioning system. When you take a luxury vacation, who wants to do all the work? Of course, noone! No worries. M/Y My Way comes with a professional crew of 8 people. Enjoy a high-level of service from the staff. They clean and provide cooking services, plus assist with your sightseeing plans during ports of call. What is a luxury cruise, without some toys to enjoy and play with on the open waters? As a result, M/Y My Way has you covered. The M/Y Way yacht comes a wide selection of toys and tenders. There’s a tender BSC 6.5m with a 150 HP Yamaha outboard. Try one of 2 3-person Jetski Yamaha racing edition VX cruisers. In addition, enjoy 2 water skis, 2 wakeboards, a knee board and 2 single inflatable donuts. For a little fun under the water, the yacht even has snorkeling equipment. In case you enjoy seafood and want to want to experience awesome salt water fishing, the yacht also provide fishing equipment. Cook up your catch and enjoy dining under the stars. Doesn’t get any better than that! Are you ready for a take a luxury yacht charter? Contact us today to book your next luxury vacation on M/Y My Way. Stop by soon to read more luxury travel articles. We love sharing travel news on our luxury blog.